Review – Phobic by Michelle Irwin – 5 Stars!!! Phoebe Reede is determined to turn her USA trip into a success. Homesick and humiliated she fights to prove her worth. With deceit and secrets in her path can she and Beau find each other again? Or is the damage irreparable? This book left me feeling full of hope and then absolute torture! I was unsure whether to love or throttle Michelle Irwin! Why you ask? Because this author has a way of dragging you into a story, keeping you hooked, intrigued and completely involved to a point where you find its 2.30am and the book suddenly finishes leaving you begging, demanding and crying for more! Michelle Irwin is truly amazing and its clear she puts her heart and soul into each of her books. Phoebe is as strong, fiery, determined and as witty as ever. She is a young woman you can look up to and take a few lessons from, although she is clearly Declan Reede’s daughter and follows his tradition of making a few wrong choices that lead her into deeper trouble rather than giving her the safe path she so desperately needs. Beau in this book frustrated me and had me questioning the man I had discovered in the first book Phase; I was unsure if I would possibly even admire the man again. 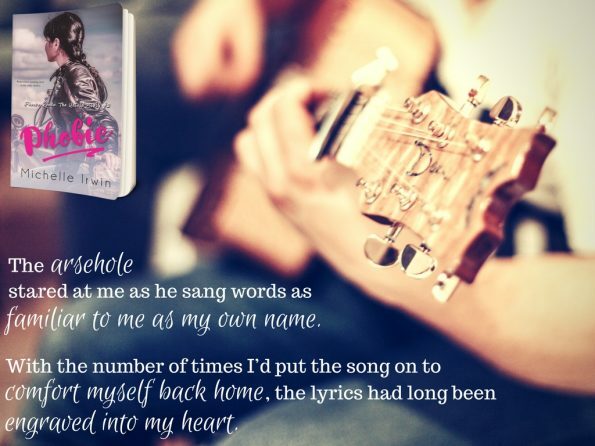 As the story progressed, I found myself falling deeper and deeper into their story and found the man I had come to love and adore. It was clear he was struggling to keep his southern charm and caring nature hidden and that he was acting a different man to hide the hurt and betrayal he felt. Phobic is going to put you through one hell of an emotional roller coaster! You will be screaming in frustration one minute then screaming in joy the next and just when you think they may have found the path they so desperately deserve and desire; within the blink of an eye everything changes and Michelle Irwin in a talented, beautiful and yet frustrating way leaves you in shock! Although this book ends on a cliff hanger it is so magically done it is with no doubt that you will join the masses in awaiting the release of the third book in Phoebe Reede’s Untold Story series. I recommend this series to readers who enjoy young adult, suspense, romances. I cannot wait for the next book in this amazing series!